The arrangement of your displays in the Displays Preference Pane (Mac OS) or the Displays Control Panel (Windows) can greatly impact performance when rendering to multiple Stages, especially true on Windows. To get the best possible performance from Isadora when rendering to multiple stages, it is important that all the stages are the same resolution and that you align their top or left edges. This article explains why this is important and gives specific examples of good and bad display arrangements. For all of these examples, we're assuming that Isadora's User Interface is on the main display 1. The alignment of this display in relation to the others has no impact on performance; you can place it in any relationship you wish to the displays used as Isadora Stages. When Isadora creates the output stages, it attempts to combine contiguous areas of the screen into one OpenGL context. For example, if you are using three Stages, and they are assigned to displays 2, 3 and 4, this would be the optimum arrangement. Because the edges of displays 2, and 3 are aligned, Isadora creates a single context for those two displays. 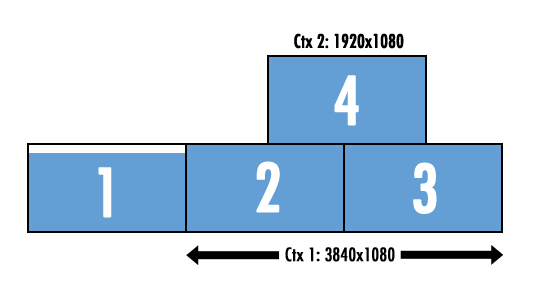 But because display 4 is not aligned with 2 and 3, it creates a second context. When it renders the stages, it now must "swap" these two contexts separately. In the worst case scenario, Isadora would have wait 33.4 mS (16.7 x 2) which is the duration of one frame at 30 fps. This can lead to a noticeable slow down of the frame rate. Similarly, you will get a second context if you put the user interface display (1) between the first and second stages. Because the top/bottom edges of displays 2, 3 and 4 are not aligned, must instead create three separate OpenGL output contexts. When it renders the Stages, it now must "swap" each one separately. In this case, Isadora might wait as long as 50.1 mS (16.7 x 3) on a 60Hz monitor, which is now longer than the duration of a single frame. This can have a drastic effect on your frame rate.